When building my Ultimate Developer PC I picked this motherboard, and it's lovely. 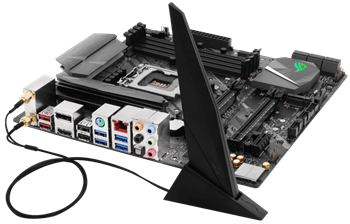 ASUS ROG STRIX LGA2066 X299 ATX Motherboard - Good solid board with built in BT and Wifi, an M.2 heatsink included, 3x PCIe 3.0 x16 SafeSlots (supports triple @ x16/x16/x8), 1x PCIe 3.0 x4, 2x PCIe 3.0 x1 and a Max of 128 gigs of RAM. It also has 8x USB 3.1s and a USB C which is nice. I put it all together and I've thrilled with the machine. 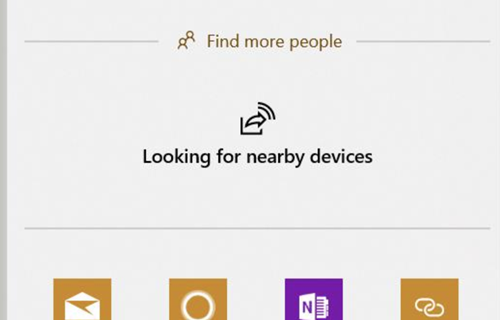 However, recently I was trying to use the new Windows 10 "Nearby Devices" feature. 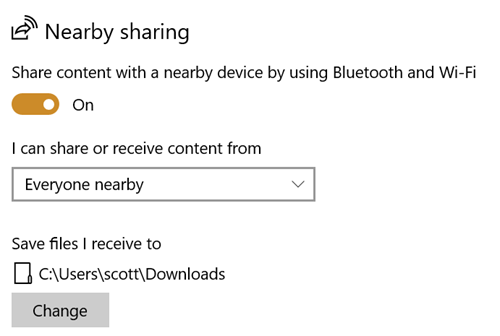 It's this cool feature that lets you share stuff to "Nearby Devices" - that means your laptop, other desktops, whatever. Similar to AirDrop, it solves that problem of moving stuff between devices without using an intermediate server. You can turn it on in Settings on Windows 10 and decide if you want to receive data from everyone or just contacts. So I started using on my new Desktop, IRONHEART, but I kept getting this "Looking for nearby devices" dialog...and it would just do nothing. Now I can easily right click on files in Explorer or Web Pages in Edge and transfer them between systems. Make sure you know your visibility settings. 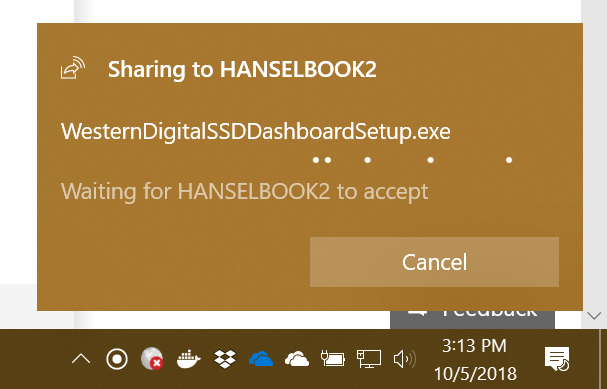 From the Start Menu type "nearby sharing" and confirm them. Make sure the receiving device doesn't have "Focus Assist" on (via the Action Center in the lower right of the screen) or you might miss the notification. Hope this helps someone because Nearby Sharing is a great feature that I'm now using all the time. 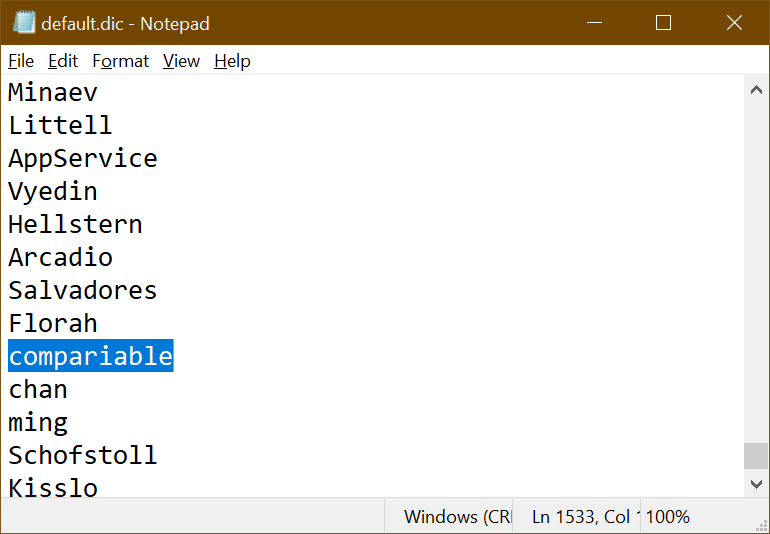 EarTrumpet 2.0 makes Windows 10's audio subsystem even better...and it's free! However, while doing my research and talking about this on Twitter, lots of people started recommending I check out "EarTrumpet" - it's an applet that lets you control the volume of classic and modern Windows Apps in one nice UI! Switching, volume, and more. 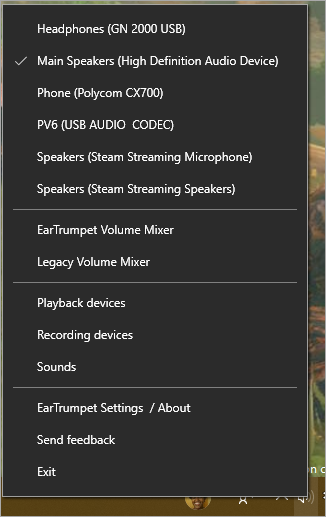 Consider EarTrumpet a prosumer replacement for the little Volume icon down by the clock in Windows 10. You'll hide the default one and drag EarTrumpet over in its place and use it instead! EarTrumpet is available for free in the Windows Store and works on all versions of Windows 10, even S! I have no affiliation with the team that built it and it's a free app, so you have literally nothing to lose by trying it out! David Golden - lead engineer on MetroTwit, the greatest WPF Twitter Client the world has never known. It was originally built as a replacement for the Volume Control in Windows back in 2015, but EarTrumpet 2.0's recent release makes it easy to use the new audio capabilities in the Windows 10's April 2018 Update. It's easy to make a crappy Windows App. Heck, it's easy to make a crappy app. But EarTrumpet is NOT just an "applet" or an app. It's a perfect example of how a Windows 10 app - not made by Microsoft - can work and look seamlessly with the operating system. 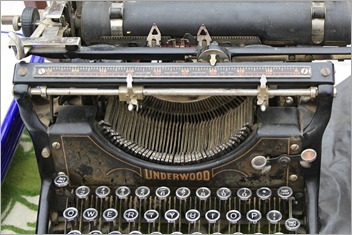 You'll think it's native - and it adds functionality that probably should be built in to Windows! It's got light/dark theme support (no one bothers to even test this, but EarTrumpet does) and a nice acrylic blur. It looks like it's built-in/in-box. There's a sample app so you can make your apps look this sharp up on Rafael's GitHub and here's the actual BlurWindowExtensions that EarTrumpet uses. EarTrumpet 1.x works on Windows "RS3 and below" so that's 10.0.16299 and down. But 2.0 works on the latest Windows and is also written entirely in C#. Any remaining C++ code has been removed with no missing functionality. EarTrumpet may SEEM like a simple app but there's a lot going on to be this polished AND work with any combination of audio hardware. As a podcaster and remote workers I have a LOT of audio devices but I now have one-click control over it all. Given how fast Windows 10 has been moving with Insiders Builds and all, it seems like there's a bunch of APIs with new functionality that lacks docs. The EarTrumpet team has reverse engineered the parts the needed. Used to pull resources out of AppX apps on the local machine without manually trying to crack open PRI files, etc. Background: https://docs.microsoft.com/en-us/windows/uwp/app-resources/using-mrt-for-converted-desktop-apps-and-games and Code here. Gets them access to new APIs (GetPersistedDefaultAudioEndpoint / SetPersistedDefaultAudioEndpoint) in RS4 that let's them 'redirect' apps to different playback devices. Same API used in modern sound settings. Code here with no public API yet? Code here and no public API yet? From a development/devops perspective, I am told EarTrumpet's team is able to push a beta flight through the Windows 10 Store in just over 30 minutes. No waiting for days to get beta test data. They use Bugsnag for their generous OSS license to catch crashes and telemetry. So far they're getting >3000 new users a month as the word gets out with nearly 100k users so far! Hopefully +1 as you give EarTrumpet a try yourself! I recently blogged about an amazing little utility called AudioSwitcher that makes it two-clicks easy to switch your audio inputs and outputs. I need to switch audio devices a lot as I'm either watching video, doing a podcast, doing a conference call, playing a game, etc. That's at least three different "scenarios" for my audio setup. I've got 5 inputs and 5 outputs and I've seen PC audiophiles with even more. Then I got "EarTrumpet" - it's an applet that lets you control the volume of classic and modern Windows Apps in one nice UI! Switching, volume, and more. Very "prosumer," which is me, so I dig it. 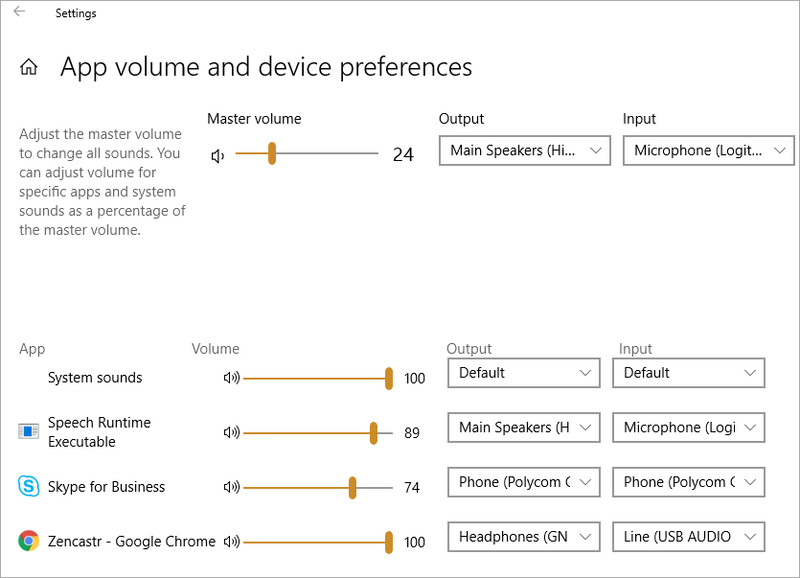 Hit the Start Menu and search for either "Sound Mixer" or "App Volume"
There's a page that does double duty called App Volume and Device Preferences. See where it says "Change the device or app volume?" Ok, now DRINK THIS IN. You can set the volume in active apps on an app-by-app basis. Cool. NOT IMPRESSED ARE YOU? Of course not, because while that's a lovely feature it's not the hidden power I'm talking about. Read that again. I'll wait. Rather than me constantly using the Audio Switcher (lovely as it is) I'll just set my ins and outs for each app. The only catch is that this list only shows the apps that are currently using the mic/speaker, so if you want to get a nice setup, you'll want to run apps in order to change the settings for your app. I record my podcast with Zencastr so I've setup Chrome for my preferred/optimal settings. I can still use the AudioSwitcher but now my defaults are contextual so I'm switching a LOT LESS. Be sure to pick up "EarTrumpet" for even more advanced options!